Is math your favorite subject or your most hated topic in school? Are you looking for free online math help, math fun and other useful resources? In this site, you will find interesting quizzes, practice, homework help and other materials to keep you occupied; or fun facts, games, puzzles and other cool stuff to make this subject something to be enjoyed rather than dreaded. Have some fun while learning some key skills to improve your grades. For parents, teachers and educators, there are loads of materials here for teaching and learning online. Find interesting and fun stuff to help your kids, students and children to enjoy, appreciate and learn numbers, counting, arithmetic, fractions, computation, geometry, statistics, set theory, trigonometry and even algebra and matrices! Check out our Interactive Zone for dynamic online worksheets, exercises and other simulations. 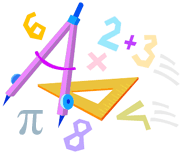 You can also use our free calculators and math tools to check your answers for many types of math problems: Basic Math, Pre-Algebra, Algebra, Trigonometry, Precalculus, Calculus, Statistics, Graphing and Matrices. Become a fan at our FaceBook page to follow our updates or to give us your feedback and comments. Do let us know how we can continue to improve our website. Are you looking for free math help that is suitable for a particular grade? Here, we have thousands of free math videos that are categorized according to grades. You can view the videos as many times as needed and learn math at your own speed. We also have free worksheets and games that will help you to understand the concepts better. Go to the menu for Grades. Do you need extra help in a particular math topic or maybe you did not understand your textbook? We have hundreds of free online math tutorials that can help you. Each tutorial will explain the math concepts and provide worked solutions. Videos are also included to help improve your learning. Go to the menu for Topics. For more specific key words, try our search engine below. Our free math worksheets will allow you to practice essential math skills and to reinforce important math concepts. We have worksheets for many math topics. We have worksheets for Addition, Subtraction, Multiplication, Division, Money, Integers, Measurements, Decimals, Fractions, Algebra, Geometry, Time, Trigonometry, Statistics, Probability, Percents, Number Patterns, Complex Numbers and more. Go to the menu for Worksheets. We also have math worksheets according to grades from Grade 1 to Grade 8. Also, visit our Interactive Zone if you want to define your own parameters for the worksheets. Are you preparing for the SAT, ACT, GMAT or GRE test? Check out our pages here for math help and useful tips for SAT, ACT, GMAT, and GRE. If there are any other topics that you will like us to add, feel free to contact us via our Facebook page or Feedback page. Are you looking for lessons, worksheets and games that are suitable for the Common Core Math Standards? We have lots of free resources to help parents, teachers and students. Do you need to systematically go through a series of math lessons? You can now have a "private tutor" for free. These math videos are presented by experienced teachers who will guide you step-by-step through the math concepts. We have also included videos for many topics. Some of the videos are hosted on YouTube and your network must allow access to YouTube in order to view the videos. Are your students or children learning the Engage NY Common Core Math? We have lesson plans, worksheets (from the NYSED) and videos to help you prepare to teach Common Core Math in the classroom or at home. Mid-module and End-Module Assessments are also included. Would you like to have some fun with Math? Have a look at our extensive collection of math fun stuff - math trivia, math games, math tricks, jokes, riddles, funny quotes, brain teasers, puzzles, mnemonics and more. Go to the menu for Fun & Games. Are you preparing for a particular standardized test or examination, but do not know what to study? Here, we have free math videos that will help to prepare you for the test (SAT, ACT, GMAT, GRE, Regents, California Standards, GCSE Maths or A-level Maths). The videos also include relevant Practice Test Questions and Answers. Go to the menu for Math for Tests. In addition to Math, we have also included topics like General Science, Biology, Chemistry and Physics. We have resources suitable for many different levels; from grades 1 to 12, High School, AP, College, Key Stage 3 and IGCSE. We also have English Grammar Lessons, resources for students who are learning English as a Second Language and those who are preparing for the TOEFL or IELTS examinations. We have some video lessons to teach the Java and Python Programming Language. For those who may need a private tutor, we can help you find a suitable tutor. Go to the menu for other topics. For Feedback or Questions, please submit via our Feedback Page, or become our fan on Facebook and leave your comments there.